I purchased my 2007 Camry at Down East Toyota of Brewer, Maine on Saturday, June 2nd. I traded my 2005 buick LaCrosse with 22,500 miles. By Monday, June 4th, I began to experience a dangerous hesitation/downshifting problem. I immediately called the Down East Toyota service department and told them of problems I was experiencing. The person I spoke with related to me that this is a common complaint with that model Camry, and that I should drive the car for at least one week in order for the car to 'learn' my driving habits. I followed his advice exactly, and at end of week with no change I called Down East Toyota service department again. This time the person on the phone told me that the hesitation/downshifting problem is at this time normal but not to worry because apparently the v6 Camrys had to be pulled from the lot for transmission problems. He stated that when and if Toyota comes up with a fix they will let me know. I asked about what I had been told the week before about driving car for a week person on phone laughed and said it was true that the car will learn driving habits but that this will not help with the hesitation/downshifting problems I was experiencing. I asked several more questions about problem and was told to talk to salesman who sold me the car, see what he can do. I called my salesman and asked him of complaints I was having he told me to come in and drive another 2007 to see it does same thing. I said no thank you but I will come in and get my 2005 buick lacrosse back, he said no problem. After work I went to the Down East Toyota dealership and, to my surprise, my old car was sitting there in front row waiting for me. I was never so glad to see that LaCrosse. My salesman greeted me at door and said it was funny, the Saturday I purchased my Camry he sold three altogether, and two have already come back. I didnt think it was funny at all. At the paperwork signing I found I would be losing the $5000 cash I had put down on the Camry, and will owe $2000 more on the Buick than I did 9 days ago when I traded it in on the Camry. At the time I was told there was no fix for the Camry. Just that morning as I was pulling into traffic car hesitated and jumped forward violently, almost hitting a UPS truck. I felt like I had no choice but to trade the vehicle in or I would be stuck with it as the salesman claimed. Several days later I wanted someone at Down East Toyota to explain why I lost so much money on the transaction. I called to talk to their customer relations person and was told they were on vacation, and left a message for that person to call me back. Weeks later and still no call, so I called back and left another message. Fast forward to September (yes, three months later) I called again asking to leave a voice message for their customer relations person. To my surprise Kevin Kelly called me back, I asked him about why I lost so much money for a problem that Toyota admits to. Kevin Kelly called me a liar and said no one at Toyota would tell me that there is a problem with this Camry, and he said he can do as he wishes and there is nothing you can do, because he did not hold a gun to my head to buy the camry or to trade it back in. I have discovered that he is right, there is nothing i can do, other than simply live and learn. I should have done what my heart was telling me to do on the third day, and bring car back, stopping payment on the down payment check and get my old car back. I was afraid I would have gone to jail or something. 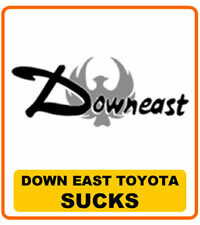 Down East Toyota qualifies as the RIP OFF ARTISTS of the YEAR. Thank you for letting me vent.